The impressive Statue of Liberty stands before the breathtaking Manhattan skyline, symbolizing freedom and independence to all who see her. This 335-foot high, 250-ton statue was a gift from France tothe United States. It was erected in 1886, in New York Harbor as a sign of solidarity between the two nations. To honor this world-famous symbol of freedom, we present this exclusive commemorative coin. 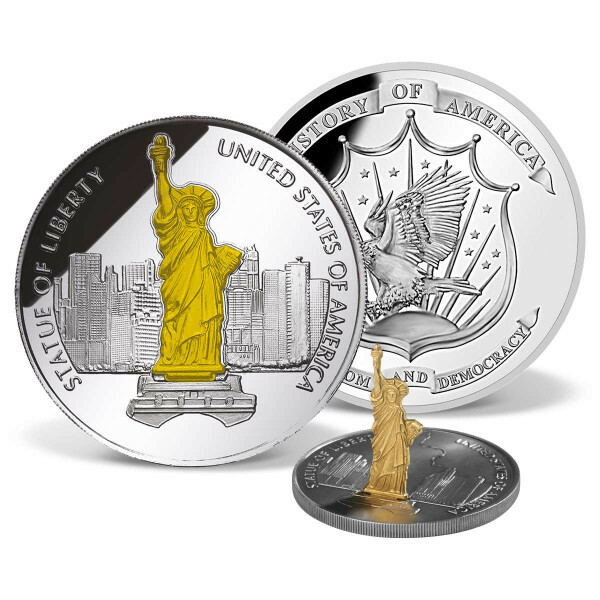 The gold-plated Lady Liberty inlay can be popped up to a standing position on the coin for a unique presentation. Available exclusively from American Mint, it is strictly limited to only 9,999complete collections worldwide. This striking coin is minted to the highest quality "Proof  standard and comes in its own protective capsule to preserve it for generations to come - a truly unique collector's item.